Final Score Products is proud to offer Game Links, your formal link to the game. Can't wear a jersey to work? Try these. The ultimate fan gift. 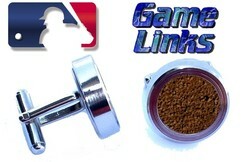 They are actual cuff links that contain real game used dirt from your favorite MLB venue. Don't be fooled by imitations. Game Links are the original. All Game Links contain actual game used dirt that has been triple verified by Steiner and the Final Score Products Authenticating Team. Get yours today. Sets are quickly selling and out are on a VERY limited run. 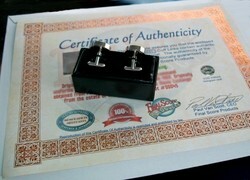 All sets come with a lifetime guarantee and a signed Certificate Of Authenticity. Get yours today! No, we do this for durability reasons. They are stainless steel and designed to last forever.